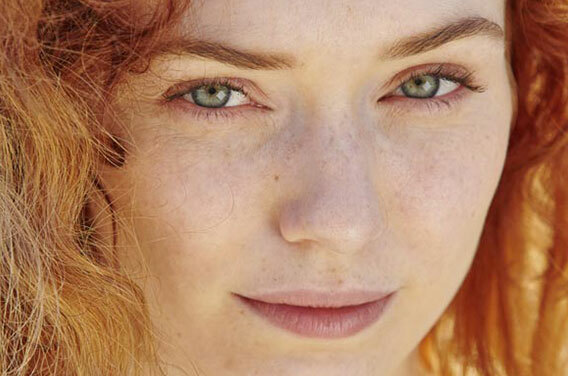 I rarely model my characters after real people (in looks or personality) but I happened to be watching Poldark while I was writing the early chapters of The Girl With the Make-Believe Husband, and I was so struck by Eleanor Tomlinson’s eyes, that I decided to give them to Cecilia. Eleanor Tomlinson, in character as Demelza on BBC's most recent production of Poldark. Speculaas are spiced shortbread biscuits that were traditionally baked for St. Nicholas Day (December 5) in the Netherlands. They are thin, slightly brown, and crispy, and US air passengers might recognize them as the type of cookies given out on many flights under the Biscoff label. 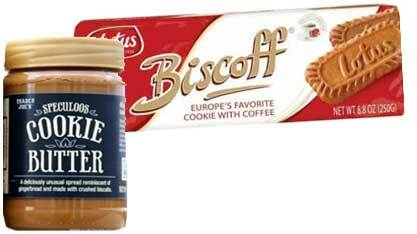 In recent years, Trader Joe’s has started using speculaas type cookies to make their now-famous Cookie Butter. TJ’s refers to the cookies as speculoos, which is the Flemish spelling of the word. British forces occupied New York City for most of the Revolutionary War, and many prisoners of war were held on prison ships moored not far off the coast. These vessels were generally damaged or obsolete, and thus not useful in battle, and conditions on board were appalling. It is estimated that well over half the men held on these ships died during incarceration, most due to malnutrition or disease. One thing about Manhattan hasn’t changed over time: space is at a premium and real estate isn’t cheap. The British army, desperate to find room for all of its soldiers, commandeered countless buildings, including churches like the one used as a hospital in the early chapters of The Girl With the Make-Believe Husband. In Edward’s letter to Cecilia from Newport, Rhode Island, he mentions that some of his men were billeted in a synagogue. 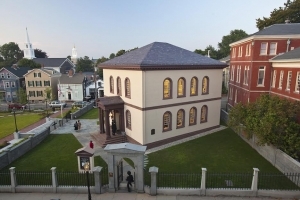 Although I didn’t mention it by name, this refers to Touro Synagogue, which is the oldest surviving Jewish synagogue in North America, and indeed, the only one that dates back to the Colonial era. 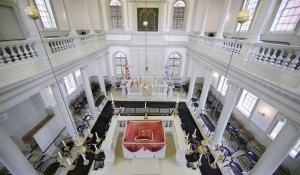 Manhattan’s Congregation Shearith Israel, founded in 1654, is the oldest U.S. congregation, but its early buildings are no longer in existence and the current synagogue, on W. 70th Street, dates from 1897. Margaret Tryon was a real historical figure. She was born Margaret Wake, and when she married she brought with her a dowry of £30,000. Her father was the East India Company’s Governor of Bombay from 1742 to 1750, and her mother hailed from an old and influential Norfolk family. Indeed, it was through these connections that Margaret’s husband William Tryon secured his first major position in the New World, that of Lieutenant Governor of North Carolina in 1764. Margaret was thought to be an eccentric, and indeed a little “mannish,” due to her interest in military matters over more traditionally feminine pursuits. In 1773, the New York Governor’s Mansion burned to the ground, and the Tryons’ daughter (also named Margaret) was saved when her governess threw her out a second-story window into a snowbank. Ironically, Margaret Tryon (the younger) later died during a botched elopement in England when she fell from a ladder and impaled herself on a fence. It would not have been a silly question. 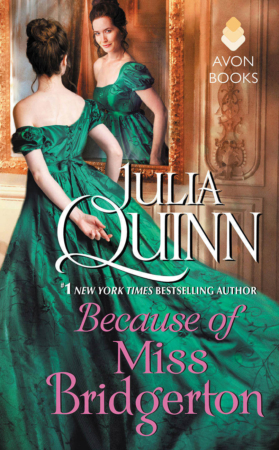 Because no matter what Colonel Stubbs thought— no matter what everyone at this rather poorly outfitted military hospital thought, her name was not Cecilia Rokesby, it was Cecilia Harcourt, and she most definitely was not married to the rather handsome dark-haired man lying in the bed at her side. It might have been something to do with her declaring that she was his wife in front of his commanding officer, two soldiers, and a clerk. She couldn’t remain in Derbyshire. And yet she’d had nowhere to go. So in what was probably the only rash decision of her life, she’d packed up her house, buried the silver in the back garden, and booked passage from Liverpool to New York. When she arrived, however, Thomas was nowhere to be found. She’d located his regiment, but no one had answers for her, and when she persisted with her questions, she was dismissed by the military brass like a pesky little fly. She’d been ignored, patronized, and probably lied to. She’d used up nearly all her funds, was getting by on one meal a day, and was living in a boarding house room directly next to a woman who might or might not have been a prostitute. But then, after nearly a week of getting nowhere, Cecilia overheard one soldier telling another that a man had been brought to hospital a few days earlier. He’d had a blow to the head and was unconscious. His name was Rokesby. Edward Rokesby. It had to be. Cecilia had never actually laid eyes on the man, but he was her brother’s closest friend, and she felt like she knew him. She knew, for example, that he was from Kent, that he was the second son of the Earl of Manston, and that he had a younger brother in the navy and another at Eton. His sister was married, but she had no children, and the thing he missed most of all from home was his cook’s gooseberry fool. His older brother was called George, and she had been surprised when Edward had admitted that he did not envy him his position as heir. With an earldom came an appalling lack of freedom, he’d once written, and he knew that his place was in the army, fighting for King and Country. Cecilia supposed that an outsider might have been shocked at the level of intimacy in their correspondence, but she’d learned that war made philosophers of men. And maybe it was for that reason that Edward Rokesby had begun adding little notes of his own at the end of Thomas’s letters to her. There was something comforting about sharing one’s thoughts with a stranger. It was easy to be brave with someone one would never face across a dining table or in a drawing room. Or at least this was Cecilia’s hypothesis. Maybe he was writing all the same things to his family and friends back in Kent. She’d heard from her brother that he was “practically engaged” to his neighbor. Surely Edward was penning letters to her too. A silly smile had erupted across her face, and then she’d felt the veriest fool. She was mooning over a man she’d never even met. A man she probably never would meet. But she couldn’t help it. It didn’t matter if the summer sun was shining brightly across the lakes—with her brother gone, life in Derbyshire always seemed so gray. Her days rolled from one to the next, with almost no variation. She took care of the house, checked the budget, and tended to her father, not that he ever noticed. There was the occasional local assembly, but over half the men her age had bought commissions or enlisted, and the dance floor always contained twice the number of ladies as gentlemen. Her heart did a little flip. Honestly, it was the closest she’d got to a flirtation in years. It had been the worst day of her life. The letter had been addressed to her father, of course. Cecilia had thanked the messenger and made sure he was given something to eat, never once mentioning that Walter Harcourt had died unexpectedly three days earlier. She’d taken the folded envelope to her room, closed and locked the door, and then stared at it for a long, shaky minute before summoning the courage to slide her finger under the wax seal. Her first emotion had been one of relief. She’d been so sure it was going to tell her that Thomas was dead, that there was no one left in the world she truly loved. An injury seemed almost a blessing at that point. But then Cousin Horace had arrived. Cecilia hadn’t been surprised that he had shown up for her father’s funeral. It was what one did, after all, even if one didn’t enjoy particularly close friendships with one’s relations. But then Horace had stayed. And by God, he was annoying. He did not speak so much as pontificate, and Cecilia couldn’t take two steps without him sidling up behind her, expressing his deep worry for her well-being. Worse, he kept making comments about Thomas, and how dangerous it was for a soldier in the colonies. Wouldn’t they all be so relieved when he returned to his rightful place as owner of Marswell. The unspoken message being, of course, that if he didn’t return, Horace would inherit it all. Bloody, stupid entail. Cecilia knew she was supposed to honor her forebearers, but by God if she could go back in time and find her great-great-grandfather, she would wring his neck. He’d bought the land and built the house, and in his delusions of dynastic grandeur he’d imposed a strict entail. Marswell went from father to son, and if not that, any male cousin would do. Never mind that Cecilia had lived there her entire life, that she knew every nook and cranny, that the servants trusted and respected her. If Thomas died, Cousin Horace would swoop in from Lancashire and take it all away. Cecilia had tried to keep him in the dark about Thomas’s injury, but news like that was impossible to keep under wraps. Some well-meaning neighbor must have said something, because Horace didn’t wait even a full day after the funeral before declaring that as Cecilia’s closest male relative, he must assume responsibility for her welfare. Clearly, he said, they must marry. No, Cecilia had thought in shocked silence. No, they really must not. “I shall go to my great aunt,” she said. If it meant avoiding marriage to Horace, yes. “I will make you see reason,” Horace growled, and then before she knew what he was about, he kissed her. Cecilia drew one breath after he released her, and then she slapped him. Horace slapped her back, and a week later, Cecilia left for New York. The journey had taken five weeks—more than enough time for Cecilia to second- and third-guess her decision. But she truly did not know what else she could have done. She wasn’t sure why Horace was so dead-set on marrying her when he had a good chance of inheriting Marswell anyway. She could only speculate that he was having financial troubles and needed someplace to live. If he married Cecilia he could move in right away and cross his fingers that Thomas would never come home. Cecilia knew that marriage to her cousin was the sensible choice. If Thomas did die, she would be able to remain at her beloved childhood home. She could pass it along to her children. She couldn’t do it. Marswell wasn’t worth it. Still, her situation was tenuous. Horace couldn’t actually force her to accept his suit, but he could make her life very uncomfortable, and he was right about one thing—she couldn’t remain at Marswell indefinitely without a chaperone. She was of age —barely, at twenty-two— and her friends and neighbors would give her some leeway given her circumstances, but a young woman on her own was an invitation for gossip. If Cecilia had a care for her reputation, she was going to have to leave. The irony was enough to make her want to scream. She was preserving her good name by taking off by herself across an ocean. All she had to do was make sure no one in Derbyshire knew about it. But Thomas was her older brother, her protector, her closest friend. For him she would make a journey that even she knew was reckless, possibly fruitless. Men died of infection far more often than they did of battlefield injury. She knew her brother might be gone by the time she reached New York. She just hadn’t expected him to be literally gone. It was during this maelstrom of frustration and helplessness that she heard of Edward’s injury. Driven by a burning need to help someone, she had marched herself to the hospital. If she could not tend to her brother, by God she would tend to her brother’s best friend. This voyage to the new world would not be for nothing. The hospital turned out to be a church that had been taken over by the British army, which was strange enough, but when she asked to see Edward, she was told in no uncertain terms that she was not welcome. Captain Rokesby was an officer, a rather sharp-nosed sentry informed her. He was the son of an earl and far too important for visitors of the plebian variety. Cecilia was still trying to figure out what the devil he meant by that when he looked down his nose and told her that the only people allowed to see Captain Rokesby would be military personnel and family. And once that had come out of her mouth, there was really no backing away from it. In retrospect, it was amazing she’d got away with it. She’d probably have been thrown out on her ear if not for the presence of Edward’s commanding officer. Colonel Stubbs was not the most affable of men, but he knew of Edward and Thomas’s friendship, and he had not been surprised to hear that Edward had married his friend’s sister. Before Cecilia even had a chance to think, she was spinning a tale of a courtship in letters, and a proxy marriage on a ship. She could not regret her lies, however. There was no denying that Edward had improved under her care. She’d sponged his forehead when he’d grown feverish, and she’d shifted his weight as best she could to prevent bedsores. It was true that she’d seen more of his body than was appropriate for an unmarried lady, but surely the rules of society must be suspended in wartime. No one would know. This, she repeated to herself on an almost hourly basis. She was five thousand miles from Derbyshire. Everyone she knew thought she’d gone off to visit her maiden aunt. Furthermore, the Harcourts did not move in the same circles as the Rokesbys. She supposed that Edward might be considered a person of interest among society gossips, but she certainly wasn’t, and it seemed impossible that tales of the Earl of Manston’s second son might reach her tiny village of Matlock Bath. Well, in all honesty, she’d never quite figured that out. But as it happened, it didn’t matter. She’d run through a hundred different scenarios in her mind, but not one of them had involved him recognizing her. “Cecilia?” he said. He was blinking up at her, and she was momentarily stunned, mesmerized by how blue his eyes were. She ought to have known that. Then she realized how ridiculous she was being. She had no reason to know the color of his eyes. It seemed like something she should have known. “You’re awake,” she said dumbly. She tried to say more, but the sound twisted in her throat. She fought simply to breathe, overcome with emotion she had not even realized she felt. With a shaking hand, she leaned down and touched his forehead. Why, she did not know; he had not had a fever for nearly two days. But she was overwhelmed by a need to touch him, to feel with her hands what she saw with her eyes. Her voice caught. She couldn’t utter the lie. Not in front of Edward. But Colonel Stubbs inferred what she did not actually say, and after muttering something unsavory under his breath, he stalked off in search of a doctor. “Where am I?” he interrupted. “But where?” he asked, a little too urgently. She waited, but he did not finish his thought. “You thought you were what?” she asked. He stared vacantly for a moment, then said, “I don’t know. I was…” His words trailed off, and his face twisted. It almost looked as if it hurt him to think so hard. “I was supposed to go to Connecticut,” he finally said. “What?” Something flashed in his eyes. Cecilia thought it might be fear. “You must not overtax yourself,” Cecilia said, reaching out to take his hand in hers again. It seemed to calm him. It certainly calmed her. Cecilia’s lips parted. She tried to answer, she really did, but she could only manage to stammer a few useless pronouns. Did he actually think they were married? He’d never even seen her before this day. Cecilia knew she should try to comfort him, but she could only stare. His eyes were hollow, and his skin, already pallid from his illness, seemed to go almost gray. 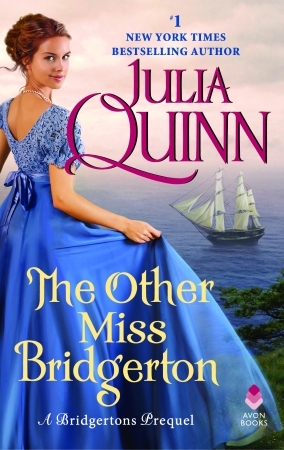 He gripped the bed as if it were a lifeboat, and she had the insane urge to do the same. The room was spinning around them, shrinking into a tight little tunnel. And he looked like he might shatter. She forced her eyes to meet his and she asked the only question that remained. “Let me up,” he argued, although some tiny rational part of his mind was trying to remind him that he didn’t know where to go. But he was far too agitated to listen. “What day is this?” he demanded. “The date,” he bit off. The man looked to Cecilia with wide eyes, silently asking for guidance. Her throat worked, and Edward knew he should be ashamed of himself for bringing her so close to tears. She was a lady. She was his wife. But surely she would forgive him. He had to know… he had to understand what was happening. Her face trembled as she rose to her feet, and she tucked a lock of her hair behind her ear before clasping her hands together. She was nervous, that much was easy to see. And then the most disjointed thought popped into his head—she didn’t look very much like that miniature her brother carried about. Her mouth was wide and full, nothing like that sweet, mysterious half moon in her portrait. And her hair wasn’t golden, either, at least not the heavenly shade rendered by the painter. It was more of a dark blond. Rather like Thomas’s, actually, although not quite as shot through with brass. He supposed she didn’t spend as much time in the sun. 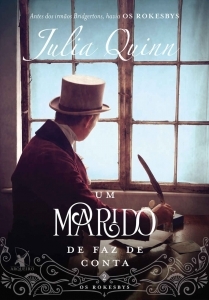 “You are Cecilia Harcourt, aren’t you?” he asked. Because it had just occurred to him—she had never actually confirmed this fact. “But we’re married.” He wasn’t sure whether he’d said it as a statement or a question. He wasn’t sure if he wanted it to be a statement or a question. She sat warily on the bed. Edward didn’t blame her for her hesitance. He’d been thrashing about like trapped animal. She must be quite strong to have been able to subdue him. Or else he’d become quite weak. She jerked back, and they both looked over at Colonel Stubbs, who was stalking across the chapel with the doctor in tow. “Why are the blankets on the floor?” the colonel demanded. “I’m not confused,” Edward snapped. The doctor looked at her. Edward wanted to grab him by the throat. Why was he looking at Cecilia? He was the patient. “He seems to be missing…” Cecilia caught her lip between her teeth, her eyes flitting back and forth between Edward and the doctor. She didn’t know what to say. Edward couldn’t blame her. “Mrs. Rokesby?” the doctor prodded. There it was again. Mrs. Rokesby. He was married. How the hell was he married? “Spit it out, woman,” Colonel Stubbs barked. Edward was half out of the bed before he realized what he was about. “Your tone, colonel,” he growled. Edward snorted and would have rolled his eyes except she chose that moment to lay a gentle hand on his shoulder. His shirt was thin, almost threadbare, and he could feel the soft ridges and contours of her fingers settling against him with cool, quiet strength. It calmed him. His temper did not magically evaporate, but he was able to take a long, even breath—just enough to keep himself from going for the colonel’s throat. “He was not sure of the date,” Cecilia said, her voice gaining in certitude. “I believe he thought it was…” She looked over at Edward. “Not June,” he said sharply. The doctor frowned and took Edward’s wrist, nodding as he counted his pulse. When he was through he looked first into one of Edward’s eyes and then the other. “My eyes are fine,” Edward muttered. “What is the last thing you remember, Captain Rokesby?” the doctor asked. Edward opened his mouth, fully intending to answer the question, but his mind stretched before him like an endless expanse of gray misty air. He was on the ocean, the steel blue water unnaturally calm. Not a ripple, not a wave. Not a thought or memory. He grabbed the bedsheets in frustration. How the hell was he supposed to recover his memory if he wasn’t even sure what he did remember? “Try, Rokesby,” Colonel Stubbs said gruffly. “I am trying,” Edward snapped. Did they think he was an idiot? That he didn’t care? They had no idea what was going on in his head, what it felt like to have a huge blank space where memories ought to be. Edward shook his head. He tried… he wanted to… but there was nothing. Just the vague idea that someone had asked him to go. “Well, that’s not likely now, is it?” Edward said bitterly. Oh no. That was not happening. “My wife will remain by my side,” Edward bit off. “No,” Edward said, because peace and quiet was the last thing he needed. This had to be like everything else in his life. If you wanted to excel, you worked hard, you trained, you practiced. You didn’t lie in bed, hoping for a bit of peace and quiet. He looked over at Cecilia. She knew him. He might not remember her face, but they had exchanged letters for over a year. She knew him. She knew that he could not lie about and do nothing. A searing pain shot through his skull. “My head,” Edward gasped. He must have shaken it too quickly. It felt as if his brain were slamming into his skull. “Are you remembering something?” Colonel Stubbs asked. “If I might intervene,” the doctor said. Edward heard someone step aside, and then he felt the mattress dip as the doctor sat beside him. Edward shook his head, slowly this time. It felt as if the only way to fight the pain was to keep his eyes tightly closed. “I understand,” Edward said. He did not like it, but he understood. Edward did not find this reassuring. “Out of hospital?” Cecilia echoed. Edward still hadn’t opened his eyes, but he heard a note of panic in her voice. Edward touched his head and winced. “I wouldn’t do that,” the doctor said. Edward finally pried his eyes open and looked down at his fingers. He’d half expected to see blood. “I can’t remove him from hospital,” Cecilia said. “Where are you staying now?” Edward asked. He was suddenly reminded that she was his wife, and he was responsible for her well-being and safety. For the first time since he’d woken up, Edward felt the beginnings of a smile. “We didn’t know she was here,” the colonel replied. A hard, cold fury began to rise within him. Edward knew the nature of the women’s boardinghouses in New York Town. It didn’t matter if he could not recall the wedding, Cecilia was his wife. And the army let her stay in such questionable lodgings? Edward had been raised a gentleman —a Rokesby— and there were some insults that could not be borne. He forgot the pain in his skull, forgot even that he’d lost his bloody memory. All he knew was that his wife, the woman he was sworn to cherish and protect, had been badly neglected by the very band of brothers to whom he had devoted the last three years. Stubbs’s brows rose. They both knew who was the colonel and who was merely the captain. But Edward was undeterred. He had spent most of his military career playing down his noble lineage, but in this, he had no such reservations. “I am not assured,” Edward responded, never taking his eyes off Colonel Stubbs. “We will find her more suitable lodgings,” Colonel Stubbs said grudgingly. Edward nodded. The Devil’s Head Inn catered primarily to British officers and was considered the finest establishment of its kind in New York Town. This wasn’t saying much, but short of installing Cecilia in a private home, Edward couldn’t think of anyplace better. New York was desperately overcrowded, and it seemed that half the army’s resources went to finding places for its men to sleep. The Devil’s Head would not have been suitable for a lady traveling alone, but as the wife of an officer, Cecilia would be safe and respected. “Tomorrow will be fine,” Cecilia said. Edward gave another curt nod. He knew Captain Montby. He, like all the officers, would give up his room in a heartbeat if it meant the safety of a gentlewoman. “It is difficult to imagine being more upset than I am right now,” Edward said. Edward decided not to point out that he had not been making a joke. Colonel Stubbs spoke briefly to Cecilia about her move to the Devil’s Head, and then the two men departed, leaving Edward once again alone with his wife. Well, alone as one could be in a church full of sick soldiers. He looked at Cecilia, standing awkwardly near his bed. He still didn’t understand how it had come to pass, but it must be true. Colonel Stubbs seemed to believe it, and he’d always been a by-the-book sort of man. Plus, this was Cecilia Harcourt, sister of his closest friend. If he was going to find himself married to a woman he didn’t think he’d actually met, he supposed she would be the one. Still, it seemed like the sort of thing he’d remember. “When were we wed?” he asked. She was staring off toward the far end of the transept. He wasn’t sure if she was listening. “I am sorry,” he said instantly. He felt like he should rise. Give her his hand. “I did not think,” he said. “You have not had much opportunity to do so,” she said in a dry voice. 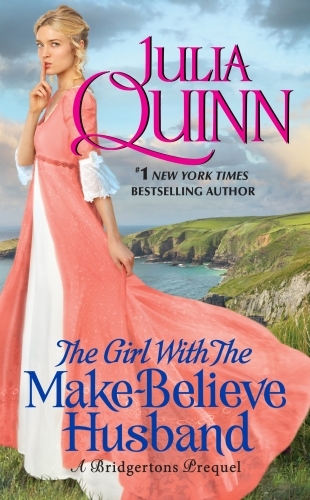 His lips parted with surprise, and then he thought—there was the Cecilia Harcourt he knew so well. Or thought he knew so well. Truth be told, he could not recall ever having seen her face. But she sounded just like her letters, and he had held her words close to his heart during the worst of the war. Sometimes he wondered if it was strange that he had looked forward to her letters to Thomas more than he did the ones coming to him from his own family. She looked over at him, and he thought he saw something a little grateful in her eyes. Such an interesting color, they were. A seafoam green so pale she would surely have been called fey in another era. Which seemed somehow wrong; she was as down-to-earth and reliable as any person he’d ever met. “Just looking at you,” he said. She flushed, and he realized he was flirting with his wife. Strange. And yet possibly the least strange thing of the day. “I wish I remembered…” he began. He wished he remembered meeting her for the first time. He wished he remembered their wedding. He wished he remembered kissing her. “I’m sure you will.” She smiled tightly, but there was something wrong about it. It didn’t reach her eyes, and then he realized that she hadn’t met his eyes. He wondered what she wasn’t telling him. Had someone told her more about his condition than she had shared with him? He didn’t know when they could have done so; she had not left his side since he’d awakened. “You look like Thomas,” he said abruptly. “Do you think so?” She gave him a puzzled look. “No one else seems to. Well, except for the hair.” She touched it then, probably without even realizing she’d done so. 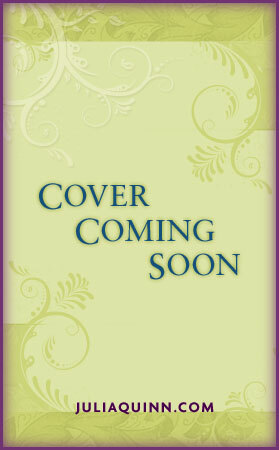 It had been pulled back into an inexpertly pinned bun, and the bits that had fallen out hung limply against her cheek. He wondered how long it was, how it might look against her back. He reached out and took her hand. “You haven’t had much to laugh about,” he said quietly. Her throat worked as she nodded, and for one awful moment Edward thought she might cry. But still, he knew he could not remain silent. “What happened to Thomas?” he asked. Bloody hell. “I am sorry,” he said. “It seems my tact has departed along with my memory.” Although in truth, he could not have known. Her dress was pink, and she showed no signs of mourning. “Our uniforms are rather uncomfortable in the summer months,” Edward agreed. “I am sure you are more fetching in pink,” Edward said. She blinked at the compliment. He could not blame her. The sheer ordinariness of it seemed oddly out of place considering their location in a hospital. Add in his lost memory and found wife and truly, he did not see how his life might get any more bizarre. Edward nodded slowly. Thomas had not said a lot about Walter Harcourt, but what he had seemed to confirm Cecilia’s description. He’d complained more than once that their father was too content to let Cecilia molder away as his unpaid housekeeper. She needed to find someone to marry, Thomas had said. She needed to leave Marswell and make a life of her own. Had Thomas been playing matchmaker? Edward hadn’t thought so at the time. “Was it an accident?” Edward asked. “The doctor said there was no way to know for certain. It doesn’t matter, though, really, does it?” She looked over at him with an achingly wise expression, and Edward could have sworn he felt it. There was something about her eyes, the color, the clarity. When they met his, he felt as if the breath was sucked from his body. Would it always be like this? Was this why he’d married her? But he didn’t want to sleep. He couldn’t bear the thought of allowing his mind to slip back into unconsciousness. He’d lost too much time already. He needed it back. Every moment. Every memory. “You didn’t say what happened to Thomas,” he reminded her. She gave a helpless shrug. “We will talk about this tomorrow,” he growled. He stared at her, drinking her in. Her jaw was set, and she had one foot slightly forward, as if ready to charge. He could almost imagine her brandishing a sword, waving it above her head with a battle cry. She was Joan of Arc. She was Boudicca. She was every woman who’d ever fought to protect her family. “My fierce warrior,” he murmured. He wasn’t sure how many things she’d managed to collect since arriving in North America, but Edward knew better than to get between a woman and her traveling trunk. And he did. He couldn’t remember the last time he looked forward to something more. Of course, he couldn’t remember anything. 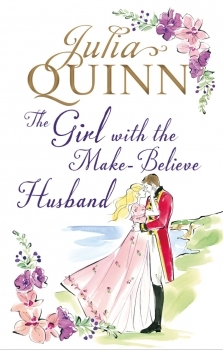 On June 7th, 2017, The Girl with the Make-Believe Husband debuted at #5 on the New York Times bestseller list. Four weeks on the USA Today bestseller list, peaking at #8.